Added on 10 March 2016 . By Jess Halladay. Word on the street is that Filipino cuisine is going to be a popular one in 2016. So given the chance to check this new trend out early with a 5-course set menu - complete with wine pairing and the company of a very good friend - who would say no, right? 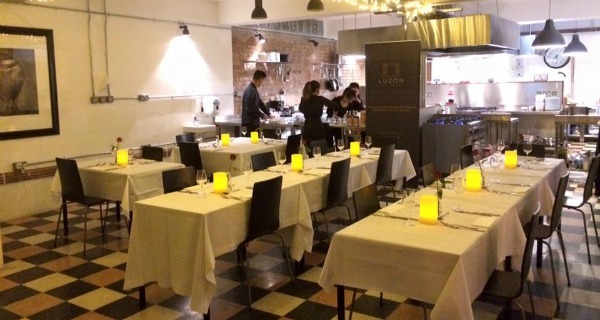 Filipino Restaurant Luzon is hosting a series of supper clubs at the London Kitchen Project's open kitchen event space in Battersea. A space whereby established and creative chefs alike take over on various dates throughout the year to showcase their menu. Attending Luzon's first supper club of the year, and on the newly recognised 'Galentine’s Day' (the day before Valentine's for close friends to treat each other and show how much they care) we took our seats with a single red rose (standing between our excited faces) on a white linen clothed table. The space is an open invite to watch the chefs in action in a relaxed, communal like setting characterised by checkered kitchen tiles, minimal decor and a great blank canvas to personalise per event. With an intimate crowd of just 14 diners, it was time to experience our first taste of Filipino cuisine. Luzon created an intimate, minimalist set-up for 14 lucky diners to sample their Filipino delicacies. On account of the weekend celebrating love with friends and partners, we were mostly accompanied by couples and the odd 'love triangle' (joking, it was just a group of friends…). The room was lit with candles and the glow of moonlight shining through the full length windows, with the communally arranged tables sitting up to 6 diners and decorated with romantic intent; good thing I really do love my friend or that would have been awkward! The music was a mix of contemporary remixes - which seemed a little out of place at first - but throughout the night the music filtered nicely in the background, allowing us to concentrate on tasting the beautifully presented plates brought to us during the course of the evening. Of course, arriving early as one always (never!) does, I was brought over a Black Sand Rum based cocktail with pineapple juice, lime juice, and coffee beans - coffee you would have thought would add a bitterness to the taste, but it was a fruity and refreshing start to the evening. I'd never usually order oysters, but the first starter of Oyster Kinilaw in Candied Ginger Dressing offered strong flavours perfectly paired with the distinctive Raboso Rosato Corte Alta Prosecco - a delightful surprise. To follow was a mix of meat and fish dishes all rich in a variety of sweet, sour and salty flavours typical of Philippine food, I was told. The Grilled Pork Cutlet 'Bistek' - Pork cutlet grilled and topped with bistek style red onions in soy-butter dressing and served with fried potatoes and wilted greens - came next and was beautifully marinated, and served with white steamed rice - although not a massive rice lover, it is one of my favourite smells and this was to be my favourite course of the evening. The dessert - Iced Avocado Parfait with Hazelnut Praline Sauce could not have been more befitting for me and my avocado obsession; I know what I'll be attempting to make on my next baking extravaganza! Luzon introduces an exotic tastes of the Philippines with a delectable range of meat and fish dishes. My Luzon dining experience opened my eyes up to yet another cuisine on the London lineup of every type of food imaginable. 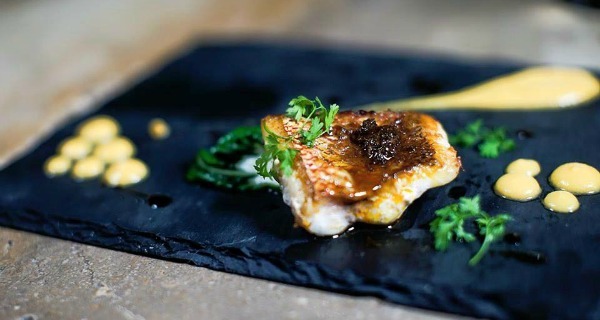 Tastefully decorated, with impressive service and showcasing some of the finest in authentic Filipino foods, don't miss out on this impressive pop-up experience; there are just two weekends left - 25th March and 22nd April.